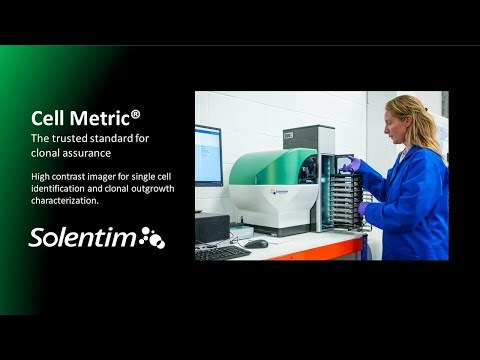 The Cell Metric® CLD is a high resolution high-throughput bench-top imaging system specifically designed to offer an alternative approach for ensuring cell line monoclonality and to speed up Cell Line Development (CLD). 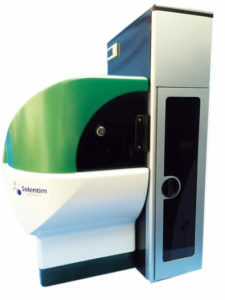 The Cell Metric® CLD system apart from its unique cell imaging and image analysis capabilities includes an integrated, temperature-controlled plate stacker. A batch of up to 10 lidded plates can be loaded manually into the stacker and the plates are automatically transferred for imaging one at a time with barcode reading. It is ideal for groups typically having throughput requirements from tens to hundreds of plates. The Cell Metric® CLD uses non-invasive brightfield imaging for analysis of settled suspension or adherent cells. . This semi-automated image documentation can be used to prove and document mono-clonality in a regulatory compliant manner by providing a permanent record of evidence with photo documentation of cell growth and development from day 1. The Cell Metric® CLD can now be purchased with fluorescence detection features that enable the user to validate a new a seeding method or quality check their existing method. (128 x 86 mm) can be imaged, including 6, 12, 24, 48, 96, 384 and 1536-well plates. High-quality plates produce the best-quality images. 650 mm x 465 mm x 500 mm/25.6” x 18.3" x 19.7"